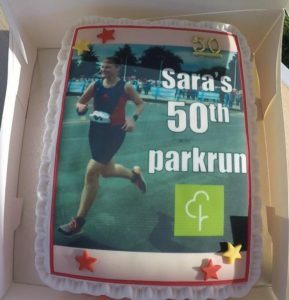 Nice to see that members have been keeping up with parkrunning in 2017, and more importantly, keeping up with the cake. Jonathan Beattie took 1st place at Carrickfergus on 2nd Sept. He was followed by Ben McCaughran, Paul Daniels, Laura Johnston, Catherine Steele, Trevor Lamb, Gemma Lovell and Kathleen McKeown. 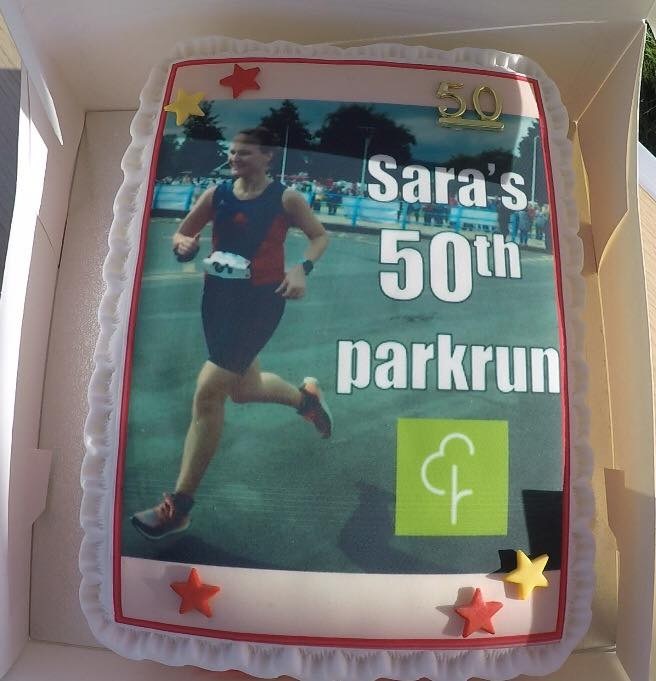 There’s also still a bit of parkrun tourism going on this year, with 8 different NI parkruns being sprinted, ran, jogged, walked and/or crawled by Seapark members this week. 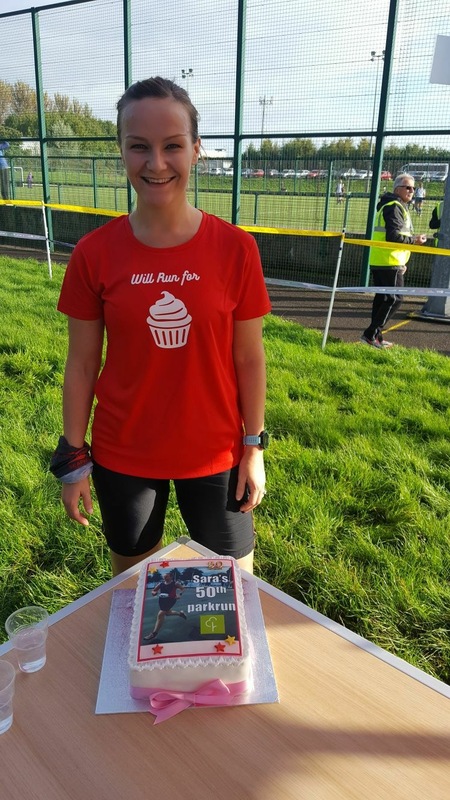 Helen Boyd achieved a course PB of 33:30 at Antrim. Ronald Simms seized 6th place on his 1st run at Bangor. Neil Harper and Karen Waring both participated in the Enniskillen parkrun before heading to Heaven via a Stairway later that same day. Ryan Campbell completed his 1st run at Queens. Ian Cleland finished in 4th place, while Sara Johnston ran a course PB of 24:46 at Stormont. Karen McMaster and Richard Hetherington both attended Valley. Bobbie Irvine, Nicola Irvine (with a course PB of 25:03) and Gavin Irvine went to Victoria. While Karen Foster was the lone Seaparker at Waterworks. 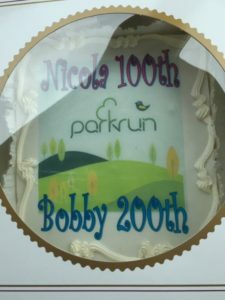 There were three milestones reached on 9th Sept with Phillip Poag and Nicola Irvine both reaching their 100th parkrun each and Bobbie Irvine having the honour of being the first Seaparker to reach 200 parkruns (no official T-shirt for this but I’m sure Bobbie will create one). William Jenkins was the first Seaparker to finish Carrickfergus parkrun this week. 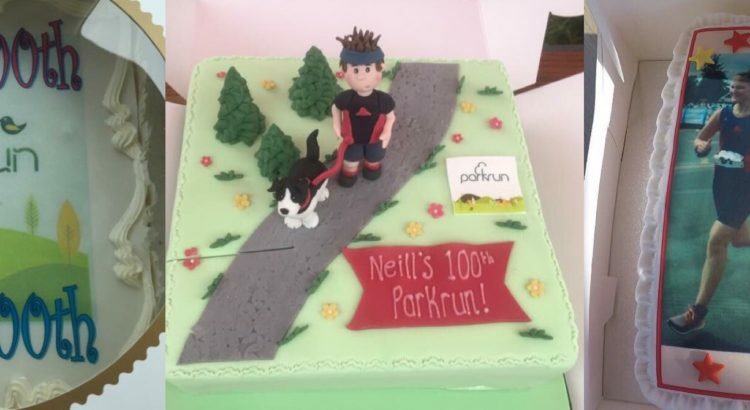 He was followed by Charlie McCormick, Ben McCaughran, Chris McCambridge, Trevor Lamb, Rebecca Tester, Simon Trimble, Phillip Poag (plotting around on his 100th parkrun), Rory Poag, Karen Poag and Michael Oglby. While it was off to Colin Glen for Bobbie, Nicola and their posse. Bobbie Irvine was 1st on his 200th parkrun and was followed by Gavin Irvine (with a course PB of 24:40), Lynda Shannon (1st run at Colin Glen), Heather Haggan, Andrew Smyth (1st run at Colin Glen), Nicola Irvine (on her 100th parkrun), Karen McIlroy (1st run at Colin Glen), Julia Lyness (1st run at Colin Glen), Catherine Steele, Neill Harper (with a course PB of 30:03), Karen Waring, Sonja McIlfatrick (1st run at Colin Glen), Donna McKee (1st run at Colin Glen) and Dawn Lyness (1st run at Colin Glen). Elsewhere Karen McMaster attended Ormeau, Kelly Miscandlon Portrush and Ronald Simms Wallace. 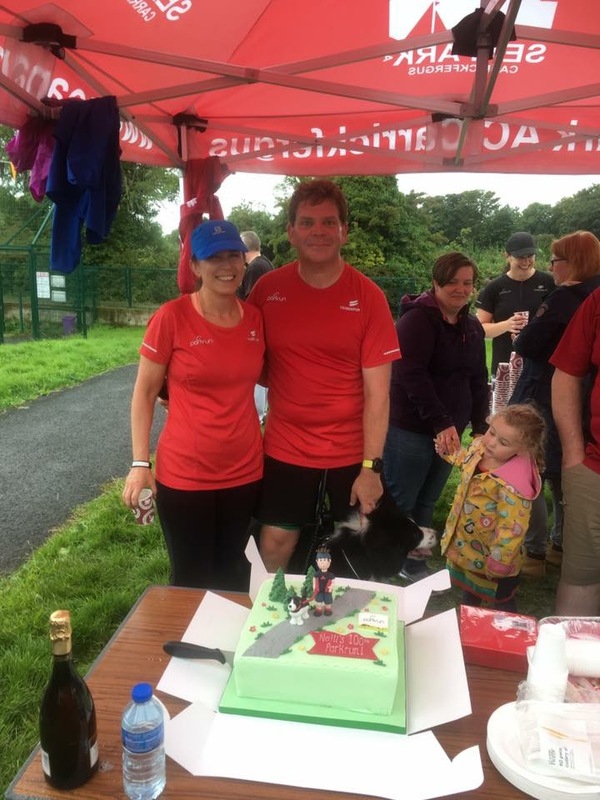 While Jonathan Beattie was 1st over the line with an assisted PB (it says it in the results) with Molly at Valley, being followed by Gillian Bell and Richard Hetherington. And at Victoria we had Brendan Rice, Matthew McCallan, Ryan Campbell (1st time at Victoria) and Allan Grant. 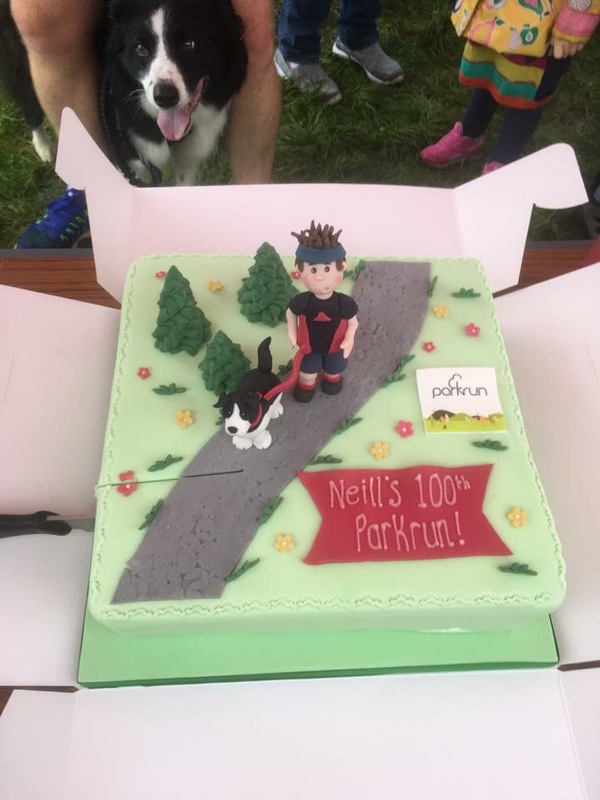 It was another good week for cake, this time supplied by Neil Harper (and Oska) for his 100th parkrun (whoop, whoop). Jonathan Beattie achieved an overall PB of 17:51 at Carrickfergus this week, coming in first. He was followed by Ian Cleland, Ben McCaughran, Robert Murray, Matthew McCallan, Lynda Shannon, Sara Johnston, Paul Daniels, Andrew Smyth, Chris McCambridge, Chris McMullan, Philip Poag, Karen Poag, Rebecca Tester, Gary Craig, Karen Waring, Jessica McMullan, Julie-Ann Mitchell, Laura Laverty, Julie Kelly, Neill Harper (on his 100th parkrun), Karen Bell, Lois Bell, Karen McMaster, Allan Grant, Susan Kane and Richard Hetherington. 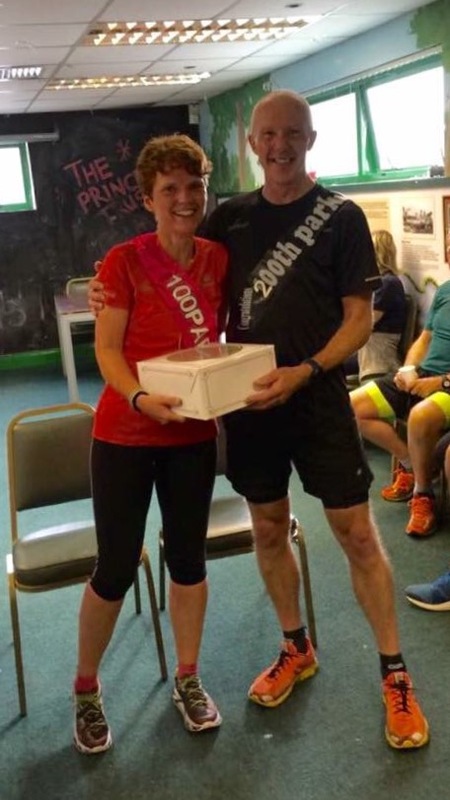 There was still a bit of tourism going on this week with Helen Boyd finishing her 1st run at Armagh, Barry Coleman going to Ormeau, Kelly Miscandlon visiting Portrush, Gavin Irvine (with a course PB of 28:11) & Bobbie Irvine running at Queens + Ronald Simms returning to Wallace. 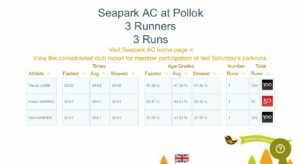 Jonathan Beattie was the first Seaparker to finish at Carrickfergus this week. Also attending where William Jenkins, Ben McCaughran, Robert Steele, Gary Craig, Simon Trimble, Kathleen McKeown and Michael Ogilby. The big one this week was the new Castewellan parkun, making the original 22 parkrun club (that became the 23 parkrun club and then the 24 parkrun club) into the 25 parkrun club. Bobbie Irvine, Neill Harper, Nicola Irvine, Allan Grant, Karen Waring, Karen McMaster, Glenda Murray and Geraldine Kane where in attendance. 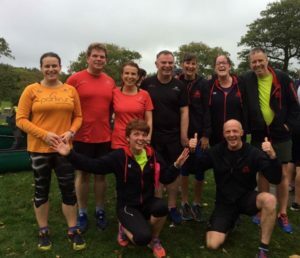 This was a bit far for some members so Ian Cleland and Sara Johnston (with a course PB of 23:34) returned to Antirm, Barry Coleman went to Ormeau, Lynda Shannon (1st time), Kelly Miscandlon & Andrew Smyth (1st time) braved the beach of Portrush, Julie-Ann Mitchell was at Stormont, Karen Poag & Gillian Bell attended Valley + Colin McCrum & Karen McIlroy (1st time) chose to do their parkruns at Victoria. Yea, it’s another cakerun at Carrick this week. 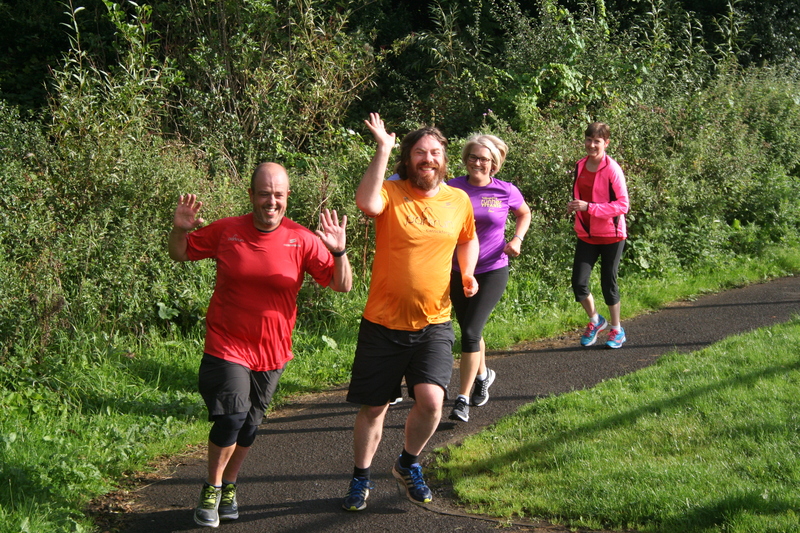 Ian Cleland was 1st over the line at Carrickfergus for the last parkrun of September 2017. 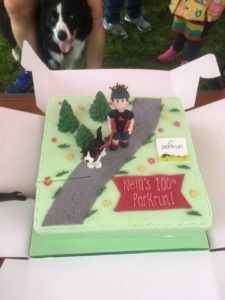 He was followed by Ben McCaughran, Brendan Rice, Paul Daniels, Sara Johnston (on her 50th parkrun), Chris McCambridge, Chris McMullan, Kathleen McKeown, Claire Hamilton (with an overall parkrun PB of 26:09), Julie Lyness, Jessica McMullan, Catherine Steele, Trevor Lamb, Laura Laverty, Gary Craig, Julie-Ann Mitchell, Julie Kelly, Susan Kane, Michael Ogilby, Bobbie Irvine, Nicola Irvine and Marie Nicholson. 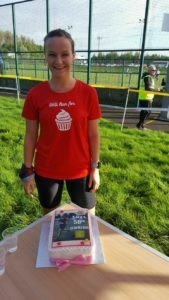 Elsewhere Sonja McIlfatrick went to Antrim for the 1st time to witness Donna McKee achieve a course PB of 31:00. It was also 1st visits for Karen McIlroy (1st time at Citypark), Helen Boyd (1st time at Comber) and Ronald Simms (1st time at Omagh) this week. 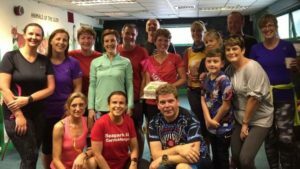 While Ryan Campbell and Rebecca Tester (with a course PB of 27:47) ran at Ormeau and Kelly Miscandlon returned to Portrush. 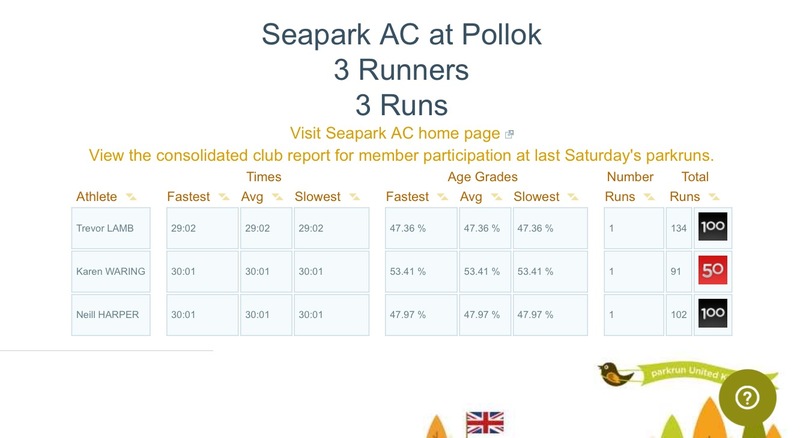 Further afield (in Scotland) two Seaparkers added their names to the Pollok, Glasgow parkrun. Karen Waring and Neill Harper may now be on the list for Pollok but someone else is still the top Seaparker there. And finally Colin McCrum achieved a course PB of 24:17 at Roding Valley. Whoop whoop!